No better time to get this post up than on the 4th of July even though this party was a couple weeks ago now. Lots of traveling has made for quite the busy month but we still managed to find time for a Patriotic Pinterest party! We had fried chicken and little patriotic cupcakes. I know what you are thinking, this food is not from Pinterest and you are right. I did make a really delicious drink called Cranberry Lime Spritzer from Pinterest and hopefully next party there will be more food made instead of buying but we were all so hungry we didn't care! We made these fun safety pin bead decorations. Inspiration here. A little time consuming to hunt through the pile of rainbow-colored beads but we all made one in about 40 minutes or so and I think they turned out great! It's a little hard to see here but these are more crafts with those wood floor samples from Home Depot! 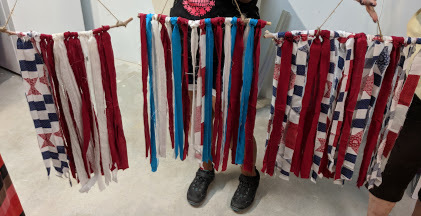 One person turned theirs into a flag yard decoration - love the creativity! Then a couple of us painted our piece red and one blue, topped it with the Mod Podge Glitter and wrapped it in stars from the Dollar Tree. We all kind of came up with our own version of a craft here. Inspiration here. This one was soo fun I think! We made tassel banners using strips of red, white and blue fabric strips. Inspiration here. I love how they all turned out so unique. I'm so glad to the people who came and took time out of their evening to attend. For the month of July I will be doing a Pinterest party in Utah only and will resume Pinterest parties again in California in August as long as there is enough interest. Hope you all have a fun and safe day today!